The trail follows a good path and is easy to follow. No blazes are used. Trail signs are at each junction. Roadside parking is available near the trailhead. The Deer Ridge Junction is a congested area. Use care while driving and walking in the area. On the trailhead kiosk, current information is posted. There are no restrooms or water at the trailhead. The last section of the trail is the steepest. Parts of the trail cross open slopes. There is sun exposure. There are exposed cliffs in several locations - along the trail and at the summit. Use care while in those areas. 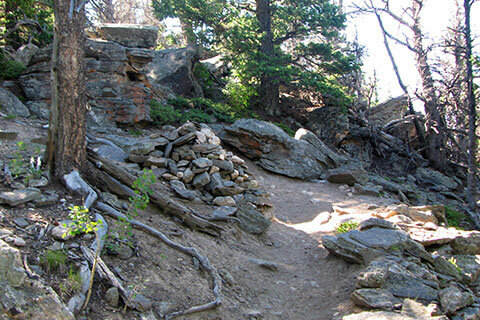 By mountain standards, the trail is only rated as a moderate climb. 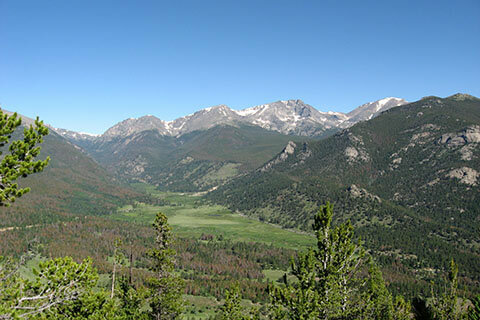 Though the hike only climbs to a bit over 10,000 feet, that is still high enough to feel the effects of altitude. If you feel sick, it is okay to turn around! As mentioned on the first page, please stay on the trail. At times it may seem easier to take a shortcut, but such a maneuver indicates poor style. Please manage your primal urges and stay on the trail! We hike to enjoy the natural world and to exercise. Shortcutting trails and damaging the environment in any way are inappropriate actions. Note: The mileage is one-way. A round trip is 6.0 miles.